Star Wars ship by me and hexagonal landing pad by Jon Gale. 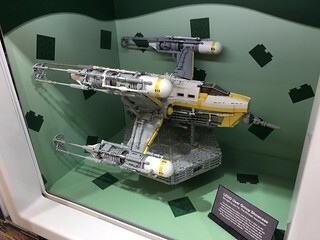 The ‘Sparkbee’ is a custom Star Wars spacecraft, inspired by the design of both the X-Wing fighter and the Y-Wing, the ageing workhorse of the Rebel fleet. It’s an ‘Ugly’, a prototype ship cobbled together from parts of several different vehicles in the Star Wars universe. Four upgraded Y-Wing engines provide increased speed. The custom hull design has extra space for transporting passengers, such as high-ranking Rebel officers. The front cannon is made from parts harvested from stolen Imperial AT-DP walkers. Play features include a retractable rear ramp, folding undercarriage, and a trapdoor for the astromech droid to drop out of. The ship took about three months to design and build and was featured in issue 22 of Blocks Magazine in 2016.